It will be a mostly sunny Saturday morning with a shower or two. 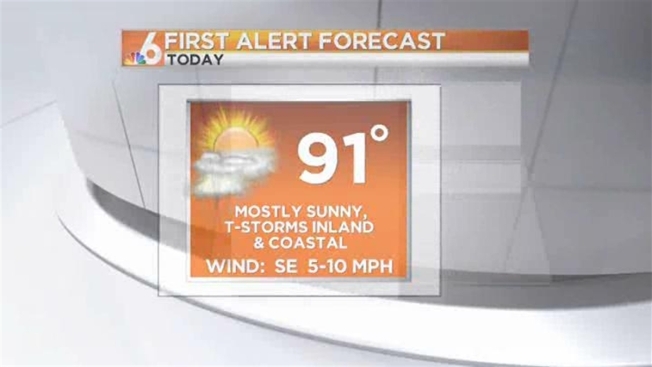 We can expect thunderstorms this afternoon mainly inland and along some east coast areas. Highs will be in the lower 90s. There should be a low risk of rip currents. Drier air will move in to South Florida leaving for mostly sunny skies on Sunday. A few isolated thunderstorms will be possible throughout the afternoon. Highs will be in the lower 90s. It will be a hazy start to the work week with better rain chances for the second half ofthe week. Highs could reach the mid-90s by mid-week.